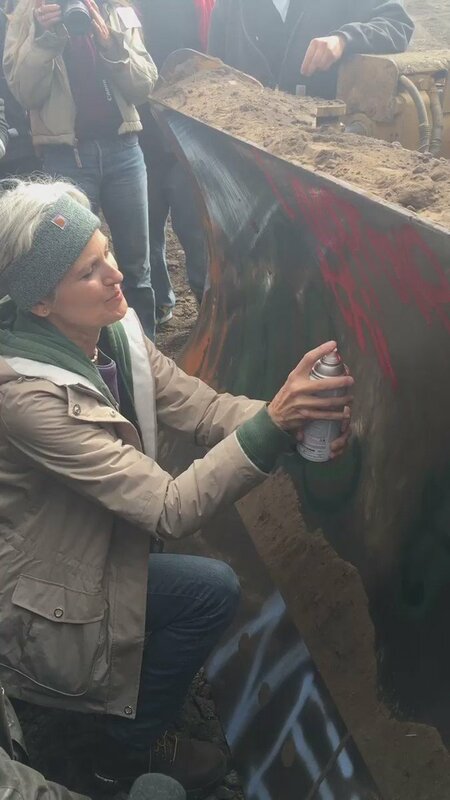 Green Party presidential candidate Jill Stein took a break from her campaign Tuesday to vandalize construction equipment at a rally in North Dakota protesting the construction of an oil pipeline. “I’m not here for a photo op. For me, this work began long before the campaign,” Stein said, telling those gathered at the protest that she was arrested in the fight to stop the building of the Keystone XL pipeline. Nearly 100 protesters gathered at a Dakota Access Pipeline construction site with Stein – meanwhile two people at the rally bound themselves to a bulldozer as construction workers looked on. Protesters peppered Stein about her policies, with one protester asking the presidential candidate if President Barack Obama will eventually show up to protest. She replied: “Exactly, where is Obama?” Stein is currently polling at 2 percent in North Dakota. Law enforcement officials monitored the situation from afar, but did nothing to intervene. Protest of the nearly $4 million dollar oil pipeline turned violent Saturday when members of a Native American tribe Standing Rock Sioux and private security forces clashed as construction crews began work on the project in Morton County, N.D.
Morton County Sheriff’s Office spokeswoman Donnell Preskey told reporters four security guards not affiliated with law enforcement and two guard dogs were injured. One of the security officers was taken to a hospital, while the two guard dogs were taken to veterinary clinic, Preskey said. She said there weren’t any reports of protesters being injured. Tribe spokesman Steve Sitting Bear disagreed, telling reporters that security dogs bit six protesters and a young child. At least 30 people were pepper-sprayed during the altercation, he added.